Here's a fun mug for you science-types. 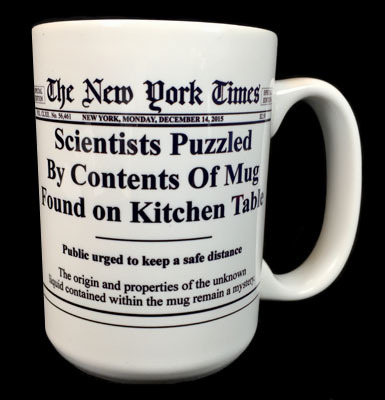 Mug reads: Scientists Puzzled by Contents of Mug Found on Kitchen Table - public urged to keep a safe distance." Like all our mugs, this one is printed on a high gloss, 12 ounce ceramic coffee mug - dishwasher safe of course. Graphic appears on both sides of the mug.